The great thing about living in a resort city is that there are always fun places to go, things to do and events to attend, and usually for free. 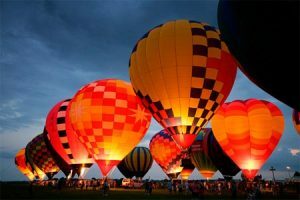 The Hua Hin Ballooning Festival. Float off just after sunrise each day from the Hua Hin Hills Vineyard for a leisurely one hour flight. Each skippered by a professional Balloon Pilot. You will then fly over beautiful rolling hills countryside before setting down for a sumptuous Champagne and Jazz Breakfast in the Breakfast Tent. The Hua Hin Kite Festival. 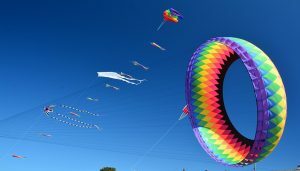 The Hua Hin International Kite Festival is held every two years in March when the winds are always favorable. In 2010, it was held over the weekend of 13-14th March. After 10 years, the event has become international with competitors coming from all over Thailand, Canada, New Zealand, China, France, India and Singapore. It’s a colorful day out for the whole family and other activities include shopping and eating – there are plenty of food stalls. It takes place at The Rama VI Army Camp just north of Hua Hin. 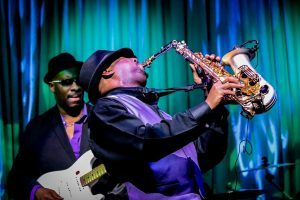 The annual Hua Hin International Jazz Festival. The annual Hua Hin International Jazz Festival. is usually held on the first week of June. It has grown rapidly over the years and is now a major international event in Thailand. It can get very crowded, so try to get their early to secure a good vantage point on the beach. The Hua Hin Golf Festival. During the months of August and September, Hua Hin and Cha-Am host The Hua Hin Golf Festival. 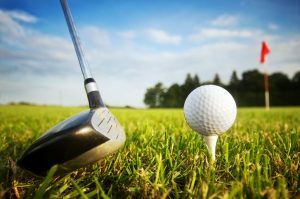 Every day during the month, green fees are heavily discounted – except for any Sunday when official tournaments are being held. Entrance to these is usually 1,200 Baht and there are always some great prizes up for grabs. Participating courses vary from year-to-year, so be sure to check first. 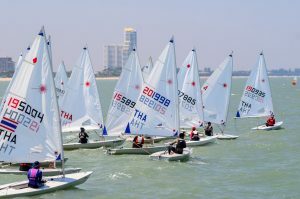 The Hua Hin Regatta also takes place at the end of July/August. In 2010, it was held over three days. It’s colourful spectacle with over 300 competitors taking part in a variety of classes. Spectating is free from the beach. 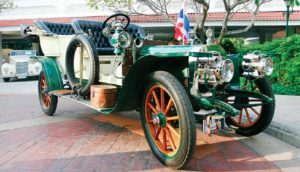 The Hua Hin Vintage Car Rally. generally takes place in December when the weather is fine. There have been eight events so far and a fine array of motor vehicles make the 225km journey from Bangkok to Hua Hin on the first day. On the second, they parade around Hua Hin following a route that takes in Hua Hin Railway Station to Klaikangwon Palace and back again. Lovers of old cars will find the rally a delight to visit. There is always a fine selection of cars in pristine condition, including E-Type Jaguars, Mercedes, Alfa Romeos, Fiats and many more. The vehicles can be inspected outside the side entrance to The Sofitel Central Hotel on Damnoern Kasem Road. 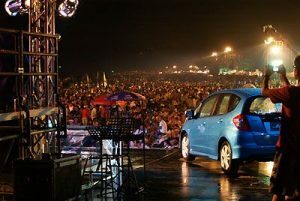 The Honda Music Festival. takes place in May on the beach at Khao Takiab, just a few kilometers from the center of Hua Hin. This Pop Reggae fest typically runs from noon to early morning with non stop musical acts. It is very popular with several hundred thousand attending the all day music fest. There are several temples in and around Hua Hin, the main being Wat Hua Hin in the center of town. This large complex is home to the many monks that can be seen collecting alms in the early morning. The temple at Bor Fai (Wat Bor Fai) has some impressive ponds teeming with catfish which you can feed after a small donation to the monks. It’s located about 5km north of Hua Hin (turn left after the PTT station opposite Anantara Resort). 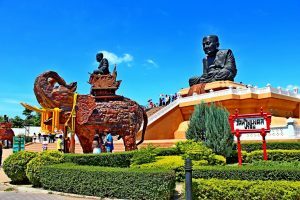 There are also several to the west of Hua Hin, especially Wat Mongkol with some impressive Buddha statues. The Kings Palace in Hua Hin – Klaikangwon is now only accessible by invitation. However the residence of Rama VI to the north of Hua Hin is open to the general public. Well worth a look as it boasts some impressive gardens and beach pagodas. 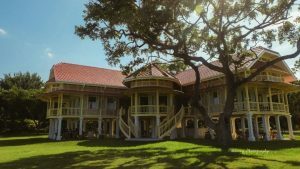 It has now been fully restored to its former glory and is the longest golden teak palace in the world. 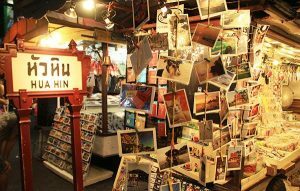 The Thai Royal Family used to visit Hua Hin regularly by train, so the railway station is steeped in history. It’s well look around and seeing The Royal Waiting Room and a fine example of an old steam locomotive. The station is situated at the top (Western) end of Damnoern Kasem Road. 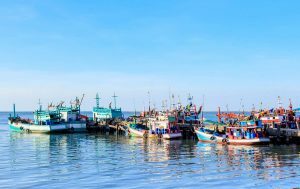 Most of the fishing fleet has been relocated further south to Paknampran and Prachuapkirikhan, nevertheless a few boats still dock there and it’s interesting to see their daily catch. You can also sample some of this fine seafood at the local restaurants in the area. The immediate vicinity is actually the old fishing village that Hua Hin once was. The maze of narrow lanes, containing many of the original wooden houses, is a must for photographers. 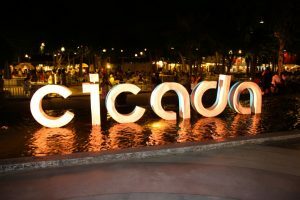 The Cicada Market (Community of Identity Culture Art and Dynamic Activities) has recently opened on the corner of Soi Moo Ban Nong Kae and Khao Takieb Hua Hin Road in Khao Takieb. Opening times are 3pm-11pm Fridays/Saturdays and 10am-9pm on Sundays. This colourful new addition to the local cultural scene features soft music, an artists’ market, good food and drink and plenty of shopping. 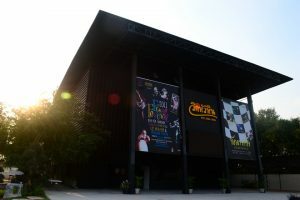 Another recent addition to Hua Hin’s vibrant arts scene is The Vic Hua Hin Art Complex and Victoria Theatre. 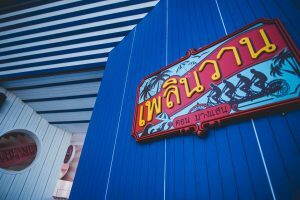 Made up of an air conditioned theatre that can seat 320, seperate sections for performing arts, workshops, visual arts exhibitions, film screenings and mini market, this centre is a must to visit for those who wish to expand their artistic experiences of Hua Hin. It is situated a couple of kilometers south of the Khao Takieb flyover on Petchkasem Road, on your right hand side. Another important location is Plearn Wan Eco Vintage Village. Found north of town on the left hand side of Petchkasem Road, just after the traffic lights at Klaikangwon Palace, this wooden complex is housed on two floors and offers a glimpse back into Hua Hin’s past. You can shop for clothes, food and souvenirs while at the weekend there is an open air cinema. Weekends can get very busy with thousands of visitors. There is wheelchair access via an elevator. 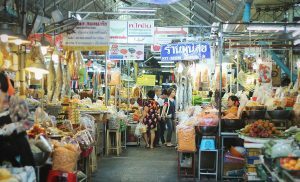 Shortage of local markets, the most popular one being the night market in the center of town. This opens daily from around 6pm till late and offers all manner of hawker food, some clothing, and a few tourist items such as wooden elephants, trinkets etc. This market is a little touristy and therefore prices are a bit higher that other local markets. Chat Chai day market is just along from the night market and is mostly undercover. 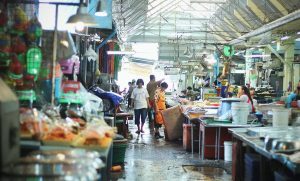 Here you can buy fruit, vegetables, fish, and meat at local prices. It has recently been through a total refurbishment and is no longer as dim and dingy as before. A visit is worth the experience to watch the locals go through their daily shopping routines. Join in as well, you’ll enjoy it. The weekend market at the Grand Hotel runs from Thursday to Sunday and offers something different again. Here you can shop for clothes, books, plants, toys, pets and tropical fish. This is another evening market starting at around 5 pm. 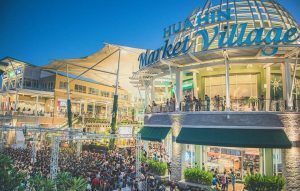 Hua Hin Market Village is the town’s first major shopping mall. 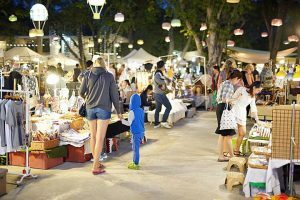 Situated some 2 km south of the center on Phetkasem Road, it offers ample parking facilities and a good range of fashion outlets, food courts and smaller local shops and stalls. The big names there include Tesco Lotus, Home Pro, Boots, KFC and Starbucks. There is a bowling alley and Major Cineplex on the top floor. Not many films have English soundtracks. There are a few ‘must eats’ when in Hua Hin. 1) Issan food. There are several good Issan restaurants in Hua Hin. The best Laab can be had at a little place called “Saddam” near the 7-Eleven across the railway, opposite the right turn towards Pala-U. 2) Seafood. There are many seafood restaurants in town and we can’t list them all, one that stands out is Chao Ley seafood at the end of Dechanuchit Rd. There are also a couple of places where you can catch you own shrimps. 3) Farang/western food. Hua Hin continues to attract ever increasing numbers of visitors, so it’s little surprise that there is a great selection of western food on offer. Most of the restaurants are situated in the center of town which can be easily navigated by foot. Many of Hua Hin’s western run bars offer extremely good “pub grub” and breakfasts. 4) Korean BBQ. This meal involves a circular barbeque where you cook your own chicken, pork, beef and seafood, Korean style. In Thai its called Moo gatar or moo yang gowlee. There are several moo gatar places north of town on Petchkasem Rd. 5) Thai food. There are hundreds of restaurants serving traditional Thai tucker. It would be impossible to even try and list some of better ones, so the best way to find your favorite is simply to experiment. If you want to swim or use the gym there are good facilities at Palm Hills Country Club (7km north) at 200 Baht per person to enjoy the pool and Sport Villa (3km south). Pool use here is 50 baht per person. In addition, some of the major hotels will allow you to use their pool facilities for a small fee, especially in the low season. Hua Hin Grand Sport has a well equipped free-style gym and martial arts training and fighting. Check out Hua Hin Sport for full details on sports and activities in Hua Hin.